Moorgate Barn in Kelbrook, near Barnoldswick, Lancashire sleeps 6 people. 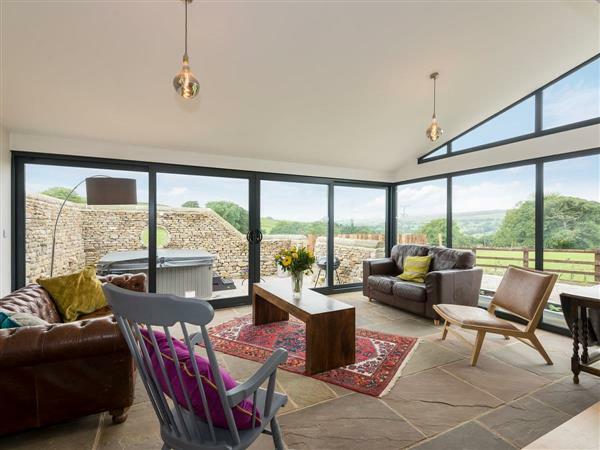 Moorgate Barn near Barnoldswick is a lovely detached barn conversion, standing adjacent to the owner’s home, and has a favourable position in a rural location. Located on a working sheep and beef farm, it is just 330 yards from the centre of the pretty village of Kelbrook. Guests at Moorgate Barn can enjoy the wonderful views of Pendle Hill and the surrounding countryside, whilst being close enough to the centre of the village to be able to walk to the local pub. With an abundance of local walks from the doorstep this is a perfect retreat for families, couples or groups of friends. The small village of Kelbrook lies on the Lancashire/Yorkshire border, which means that guests can take advantage of everything these two rural counties have to offer. Just 9 miles from the charming market town of Skipton, the ‘Gateway to the Yorkshire Dales’, guests can enjoy the local market and the selection of pubs, shops, cafés and restaurants available. Clitheroe and the Forest of Bowland, Lancashire’s Area of Outstanding Natural Beauty, is just 10 miles away and offers an abundance of walking, cycling and local gastronomy to try. After a long day exploring and sightseeing, the private hot tub, accessed from the garden room, is a welcome retreat in which to relax and recharge. The shop, pub and restaurant are all 550 yards from Moorgate Barn near Barnoldswick. Living area: With wood burner, 52 Freeview TV, Blu-ray player and Xbox One. Kitchen area: With electric oven, electric hob, microwave, fridge/freezer and washer/dryer. Oil underfloor central heating, electricity, bed linen, towels and Wi-Fi included. Initial logs for wood burner included. Travel cot and highchair available on request. Welcome pack. Enclosed patio with garden furniture and barbecue. Croft (shared). Hot tub for 4 (private). Bike store. Private parking for 3 cars. No smoking. Please note: The property has a natural water supply from a well. There is a fenced stream in the grounds, 5 yards away. Holidays at Moorgate Barn run from Friday to Friday. Pets allowed at Moorgate Barn. For a better idea of where Moorgate Barn is, you can see Moorgate Barn on the map below. Moorgate Barn is in Lancashire; should you be on the lookout for a special offer, you can find all the special offers in Lancashire. It's always worth checking to see what is on offer at the moment. Do you want to holiday near Moorgate Barn (UKC3380), you can see other cottages within 25 miles of Moorgate Barn; have a look to find your perfect holiday location.